Movie director Junichi Suzuki’s final installment of his Japanese American trilogy will arrive in theaters next month in limited release. Titled “MIS: Human Secret Weapon,” this documentary runs 100 minutes and combines archival footage with contemporary interviews and is devoted to a vital but often overshadowed part of Japanese American history — make that American history, thank you — namely, the contributions of Japanese Americans who served in the U.S. Army’s Military Intelligence Service during World War II as linguists, translators and interrogators, and after war’s end, liaisons and administrators in the U.S. occupation of Japan. I said “overshadowed” because while the MIS is mentioned along with the 100th Battalion/442nd Regimental Combat Team in discussions and documentaries about Japanese Americans who served the U.S. military during WWII, oftentimes it seems like an obligatory addition, the equivalent of a game show consolation prize. In a way, it is understandable, even though I am certain that 442 vets have nothing but the utmost respect for their Nisei and Kibei counterparts who served in the Pacific Theater and used their brains more often than bullets in service to their country. It’s just easier and more dramatic to understand casualty counts, numbers of captured POWs, names of particular battles, liberated towns and such than an important strategic revelation gleaned from translated Japanese military documents. 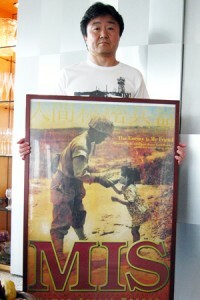 Junichi Suzuki holds a poster for his latest film. Furthermore, because of the nature of their work, the idea of MIS members discussing what they had done was verboten for many years after the war ended. Add to that the cultural mores of that generation of American men in general and Japanese Americans in particular to not draw attention to one’s accomplishments — well, it’s understandable as it is lamentable that the MIS story often got lip service and little more. Now, however, with “MIS: Human Secret Weapon,” that saga gets the full attention it deserves, thanks again to Junichi Suzuki. I first wrote about Suzuki in 2009 when his “Toyo’s Camera” — which focused on photographer Toyo Miyatake — debuted. Then, in 2010, I wrote about Suzuki again upon the release of his next documentary, the excellent “442: Live With Honor, Die With Dignity.” As could be gleaned from its title, this documentary was mostly about the storied 100th Battalion/442nd RCT. Now, in 2012, I had the chance to talk with Suzuki yet again about his third and likely last documentary on Japanese Americans, this time going into detail about the MIS. One thing I’m happy to report is that health-wise, Suzuki is much improved from a 2010 car accident he had while on the way from Los Angeles to Las Vegas to screen “442,” in which he was almost killed. While he is still undergoing physical rehab, he looks pretty healthy and strong now, considering how badly he was hurt. Suzuki is in many ways an anomaly. That is because he is both a Japanese national and a filmmaker who has used, in recent years, his professional skills to relate the story of Japanese Americans. The conventional wisdom among Japanese Americans seemed to be: “Japanese don’t know or care about Japanese Americans.” This perceived attitude, oftentimes dismissive, probably has some truth to it. In an interview I conducted with Suzuki this week, he said, “When I came to Los Angeles, I didn’t know anything about Japanese American history.” The well-intentioned but flawed 1990 movie “Come See the Paradise” was about the extent of what he knew. As Suzuki spent more time here and met and interacted with Japanese Americans, he began to learn about the federal government’s forced removal from the West Coast and subsequent incarceration of both U.S. citizens of Japanese ancestry and Japanese nationals who were barred from becoming naturalized U.S. citizens. Part of him thought that Japanese Americans should think more about the future than fixate on the past. “At the beginning I couldn’t sympathize with Japanese American history and Japanese American movies,” he said. As he met and interacted with Japanese Americans, however, he learned that “their heartache couldn’t be diminished.” Eventually, this led him to make “Toyo’s Camera,” the first installment of his trilogy. Ironically, by making documentaries about Japanese Americans, the post-war born and raised Suzuki learned what it meant to be Japanese. According to Suzuki, after Japan’s defeat, some traditional characteristics were abandoned as Japanese people focused upon rebuilding their nation and economy. Some of the best aspects of those cultural traits, however, were retained among Japanese Americans. “After World War II, Japanese people had to put away the Japanese original spirit. But Japanese Americans living here in the United States kept their Japanese spirit,” he said. In an interesting turn of events, the timing of the release of his “442” in Japan in 2010 coincided with a TBS (Tokyo Broadcasting System) dramatic miniseries, “99 Years of Love: Japanese Americans,” that dealt with the Japanese American experience. Suddenly, the Japanese American experience was in Japan’s zeitgeist. Suzuki’s “442” was a huge theatrical success in Japan, and he still makes appearances in Japan at special screenings of that documentary. It’s a good sign that Japanese Americans and Japanese can now find mutual respect, and with organizations like Kizuna, cultural ties amongst modern-day Japanese and members of the Japanese diaspora around the world can find some common ground. It’s worth noting that Terasaki gets approached all the time for this, that and the other — but according to Suzuki, Terasaki came to him and offered to support his filmmaking efforts, which included “442” and “MIS,” a true sign of respect. As for “MIS,” it is yet another strong effort by Suzuki, whose efficiency as a filmmaker amazes me. He began principal photography in February 2011, finishing in July or August, before commencing postproduction. He was able to include interviews with many notable Japanese American community members: Sen. Daniel Inouye and former JANM President Irene Hirano Inouye, former U.S. Congressman and Cabinet member Norman Mineta, ukulele virtuoso Jake Shimabukuro, actress Tamlyn Tomita, et al. 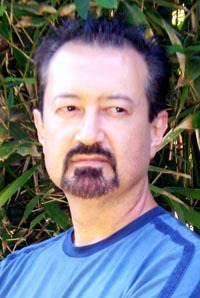 Reprising narrator duties was actor Lane Nishikawa. Most important, however, are the interviews he conducted with still-living MIS members, ranging in age from 88 to 92. Those who made it into the film were still lucid and seemingly healthy. I wouldn’t be surprised if many of them are still here 10 years from now! The stories they relate in “MIS” range from funny to poignant to heartbreaking. In making their stories available for posterity, Suzuki not only keeps alive the memory of the MIS members themselves, he insures that their stories can be passed on to the younger generations and generations to come. If the story of the MIS is of any interest to you, it is worth seeing this documentary if you have the chance. “MIS: Human Secret Weapon” will be shown in Southern California from Friday, April 6, to April 12 at Laemmle’s Noho 7 in North Hollywood; Saturday, May 19, at Nishi Hongwanji in Little Tokyo; Monday, May 28, at the James Armstrong Theatre in Torrance; Saturday and Sunday, June 2 and 3, at the Woodbridge Movies 5 in Orange County; and Saturday, June 9, at the Gaslamp 15 in San Diego. Hopefully, Visual Communications, sponsor of the L.A. Asian Pacific Film Festival, can reach out to Suzuki and get this latest movie screened at that upcoming event if it’s not too late. As for future projects, Suzuki said he has nothing definite on his plate. He’s just happy to have completed the final installment of his Nikkei trilogy. He did, however, mention that in a recent screening in December in Japan, there was some interest from a Japanese TV network to have him direct a 442 movie. Casting and language would prove interesting, as he noted in conversation. But thanks to his three documentaries, I can think of no Japanese national better suited to head such a project, should it ever come to fruition. May 28, 2012 event at The Armstrong Theatre, Torrance, CA. How do you obtain tickets and how much are the tickets?